We’ve already reviewed two Phaedrus processors — the Hydra mic preamp (SOS March 2016) and the Phamulus vari-mu compressor (SOS July 2016), both of which have unique qualities. But the subject of this review — and apologies in advance to any typographers reading this — the Shuphler Stereo Matrix, is more unusual still. Also part of the London Series, this device offers a unique set of stereo image processing tools designed to correct inherent weaknesses in a variety of conventional stereo systems and mic techniques. The term was first coined by Alan Blumlein in the 1930s, during his pioneering work at EMI developing stereo sound systems and techniques. In short, his Shuffler was conceived to process the outputs from a closely spaced pair of omni mics, converting low-frequency phase differences between the two channels into the amplitude differences necessary for the accurate recreation of stereo images from a pair of spaced loudspeakers — a scheme described in detail in Blumlein’s original 1931 patent. Unfortunately, Blumlein’s near-spaced omni mic technique (which we’d now think of as a binaural technique) has rarely been employed in the recording industry, and so his innovative Shuffler processing was largely forgotten, too. The second ‘shuffling’ process was devised in the 1950s by members of the same EMI engineering team who’d worked with Blumlein before the war. It was an entirely different processing scheme (though it used similar core technology) designed to correct and improve the imaging of all stereo loudspeaker reproduction systems. EMI incorporated this ‘Stereosonic Shuffler’ into several of their in-house REDD mixing consoles, and it was routinely employed on EMI’s classical recordings in the ’50s and ’60s — but it too was later abandoned and has largely been forgotten. So, there are really two fundamental forms of shuffler: the Blumlein Shuffler, and the Stereosonic Shuffler, and that’s how I’ll refer to them throughout this review. Both are catered for in the Shuphler, along with three other related processes. There are two variants of the Shuphler with identical front-panel functionality: a less expensive model, for educational and research applications, uses FET-based buffer stages and provides unbalanced line-level connections; and a professional model has transformer-balanced line-level I/O and a valve buffer. It’s the professional version I’m reviewing here. The Shuphler adheres to the same physical format as other London Series units, with an extruded aluminium case featuring a bright blue hexagonal front panel. The dimensions are roughly 110 x 50 x 220 mm (WHD), but the front plate extends to 150mm at its widest point. 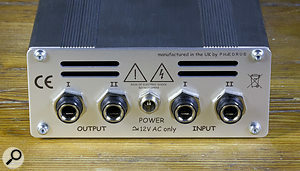 I suspect most would use the Shuphler as a stand-alone unit, powered by its supplied 12V AC wall-wart via a screw-locking coaxial connector, but it can also be mounted on an optional 2U ‘keeper plate’ for 19-inch rackmounting, and optionally partnered with the company’s Phuel linear mains power-supply module. 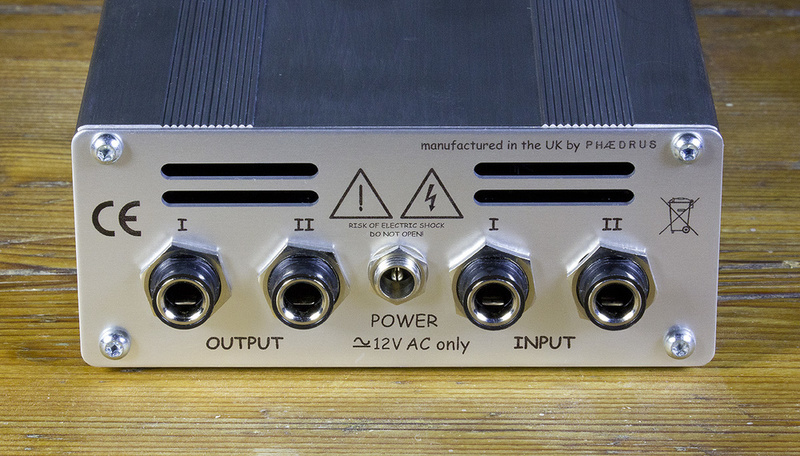 On the rear, the audio I/O are accompanied by a screw-fit power inlet, which secures the lead from the external PSU.The screw-locking coaxial power connector sits in the centre of the rear panel, flanked by two pairs of quarter-inch TRS sockets for the stereo inputs and outputs. The channels are marked I/II, rather than left-right, to avoid confusion when processing Mid-Sides signals. On the front panel, a blue LED illuminates when the unit is receiving power (there’s no on/off switch) and a single vintage-style, cream-coloured knob operates a six-position rotary switch, each option being identified with somewhat cryptic graphics and shorthand. The anti-clockwise switch position is marked with a pair of back-to-back speaker symbols and the word ‘off’; this is essentially a bypass mode. The input signals are routed to the output through the transformers and valve buffer, but with no further signal processing. The signal path is very clean and quiet, but not completely transparent — the electronics and transformers introduce a subtle vintage character, especially with hot signal levels. It’s musically benign, and actually quite a useful feature when ‘warming up’ digital recordings is desired. The second switch position is marked with the Greek symbols SD (sigmadelta), which are the standard mathematical notations for ‘sum’ and ‘difference’ — the processes required to translate between Left-Right and Mid-Sides. In this mode, the Shuphler serves as a simple Mid-Sides conversion matrix, in which output I is derived from the sum of the two input channels (L=M+S), and output II from the difference between them (R=M-S). In normal use, the Mid signal is connected to input I and the Sides to input II, but the same processing can be used to convert a left-right signal into M-S for external processing, if required. The third mode is indicated by an inverted heart symbol, and activates a bespoke shuffling configuration designed to improve the stereo imaging of coincident cardioid arrays (hence the heart). One of the persistent complaints about coincident mic techniques in general is that while they render superbly precise imaging, they lack a sense of spaciousness. The ORTF and NOS techniques space the capsules apart to try to overcome this, deliberately introducing phase shifts between the two channels, which relate to the source positions. 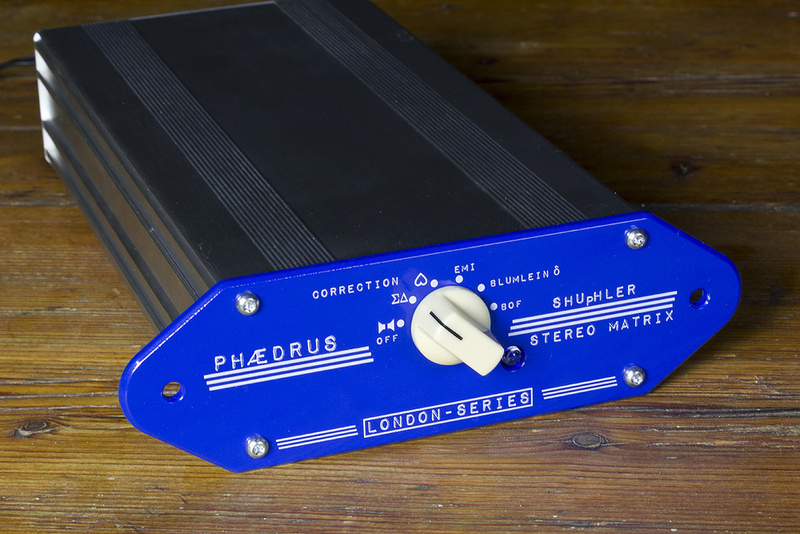 The cardioids mode in the Shuphler is claimed to introduce a similar sense of spaciousness, primarily by increasing the stereo width at low frequencies — it’s a kind of reverse Blumlein Shuffler technique, actually. The next two options provide the two original shuffling processes I described above, starting with the 1950s EMI Stereosonic Shuffler technique. This corrective processing stemmed from EMI’s research that revealed a fundamental flaw in conventional two-loudspeaker stereo (see box) in which the stereo width is inherently exaggerated for frequencies above about 700Hz, effectively blurring the stereo image slightly and reducing the perceived imaging precision. EMI’s Stereosonic Shuffler compensated for this effect by attenuating the Sides signal above 700Hz, narrowing the stereo image of high frequencies slightly to realign the spatial positions of low- and high-frequency components. However, the Stereosonic shuffling also took into account a second contributor to this problem — the natural characteristic of most directional mics to ‘beam’ at high frequencies. Beaming is where the polar pattern becomes progressively narrower as the frequency rises, something that is particularly evident in large-diaphragm mics, but affects all mics to some degree. Although ‘HF beaming’ isn’t usually a problem when working with on-axis sounds, it results in frequency-dependent sensitivity variations for off-axis sources. That’s a significant factor in a coincident mic array, which intentionally captures sounds off-axis most of the time. The effect of ‘beaming’ in a coincident array is to increase the inter-channel amplitude differences for higher frequencies, further exacerbating the frequency-dependent image smearing introduced by the stereo loudspeakers. EMI routinely employed coincident stereo arrays using figure-of-8 mics for classic music in the 1950s and ‘60s, and the Stereosonic Shuffler was designed to compensate both for the HF-beaming effect associated with figure-of-8 mics as well as loudspeaker shadowing effects (described in the box). To achieve the required image correction, the Stereosonic Shuffler introduced 3dB of attenuation to the Sides signal above 700Hz. Yet the technology of the day (balanced passive filters operating in a 200Ω matched-impedance environment) imposed some undesirable distortion, phase errors and frequency response colorations, and these tonal disadvantages were deemed to outweigh the subtle imaging benefits. And although conventional stereo was (and remains) fundamentally broken in terms of imaging precision, EMI eventually deemed ‘uncorrected’ stereo to be good enough — and we’ve lived with that for the last 60 years or more. The Shuphler implements a modern version of this Stereosonic Shuffler in the switch positioned to ‘EMI’, but it has been designed to avoid the intrinsic distortion, coloration and phase-error problems of the original implementation. Blumlein’s original Shuffler processing is provided by the penultimate switch position, labelled ‘Blumlein d’ (delta), and this is intended for use with closely spaced omni mics. The recommended microphone spacing is about 22cm, and it works equally well with a baffle placed between the mics (eg. a Jecklin disc array) and with parallel figure-of-8 mics rather than omnis (eg. the Falkner array). While the near-spaced omni arrangement — which we now think of as a binaural technique — produces very good stereo imaging when auditioned over headphones, the positional information becomes very confused and vague when heard over loudspeakers. The main reason for that is a lack of amplitude differences between the two channels, especially at low frequencies, and Blumlein’s Shuffler was designed to correct that. Put simply, this process converts low-frequency inter-channel phase differences into inter-channel amplitude differences, enabling positional information to be perceived far more accurately when auditioned over loudspeakers. The final processing mode is derived from the Stereosonic Shuffler, but employs a different approach based on frequency-dependent crosstalk, rather than the sum and difference processing used by EMI. An early development of this idea was marketed in the 1990s as the Francinstein matrix and the version in the Shuphler is an evolution of the original called ‘Bride of Francinstein’, and labelled as ‘BOF’ on the switch. 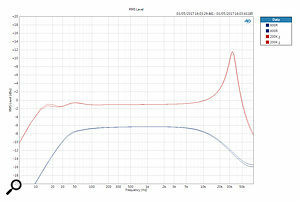 The main difference between the Stereosonic Shuffler and the BOF is in the amount of HF narrowing, with the BOF design being rather more gentle. Consequently, Phaedrus recommend the BOF mode as the best option when compensating for image errors in pan-potted stereo mixes, while the Stereosonic Shuffler is better suited to coincident pair recordings that require further compensation for the mic-beaming effect. I hooked the Shuphler into an insert point in my Crookwood mastering console to allow easy level-matched comparisons of source and processed signals at the touch of a button. Audition material included a wide range of commercial mixes, as well as a lot of my own recordings from simple stereo mic arrays. Mid-Sides (SD) transcoding is probably not a function many will require in hardware now, as more convenient transcoding facilities can be found in a DAW — but as the matrix circuitry is required as part of the other processing modes, it does make sense to offer M-S transcoding as a separate function. There are then two distinct sub-sets of other processing options: the two mic-array corrections (Cardioid and Blumlein Shuffler), and the image precision modes (EMI Stereosonic Shuffler and BOF). Given these logical subsets, and the obvious requirement to switch between them to compare the results, their arrangement across the rotary switch could be made more useful. For example, in comparing the EMI and BOF modes you have to traverse the Blumlein Shuffler, which introduces a radically different sound character, and the bypass mode is three clicks away. To me, it would have made sense to have arranged the various modes in the order of: SD (M-S matrix), Cardioids, Blumlein (d) Shuffler, Off, BOF, EMI (Stereosonic Shuffler) — the three mic-array correction modes would be to the left of a central bypass setting, and the two replay image width processors to the right, making comparison a lot simpler. But I’m a particularly pernickety character when it comes to ergonomic issues like this, so this is in no way a deal-breaker. Moving on to the auditioning, starting with the two replay image-width processes, the first thing to say is that neither the Stereosonic or BOF shufflers make a ‘night and day’ difference; the imaging improvements are, in most cases, relatively subtle. Moreover, we’re all very used to listening to uncorrected stereo and, if my experiences from countless Studio SOS visits are anything to go by, not everyone has access to monitoring conditions capable of reproducing super-accurate imaging anyway. However, with a good monitoring setup I found that the imaging precision of widely spaced instruments definitely becomes sharper and more focused when the BOF or Stereosonic shuffling modes are introduced. Indeed, after a while I found that I missed the correction when it was switched off. In some cases I preferred one mode over the other, but generally the difference between them was even more subtle than between either mode and bypass. The two mic-array correcting modes are easier to discern, because they enhance the sense of spaciousness in the recording when applied to the appropriate material. I’m not a fan of the coincident cardioid technique generally, and so have few recordings made in that way, but of those I tried I felt all were definitely improved by the cardioid processing mode. The low end became a little larger and fuller-sounding, and the imaging became a little crisper and better defined. The improvements aren’t enough to make me want to record everything with coincident cardioids, but if I were presented with a crossed-cardioid recording I would certainly process it with this system, given the choice. The Blumlein (d) Shuffler mode is not a good match for coincident mic recordings as it pushes the phase correlation into the negative side, reducing mono compatibility considerably. However, when applied to recordings made with closely spaced arrays it made a very worthwhile difference. I tried it on several recordings made with a Schneider disc (a variation on the Jecklin disc theme) and noticed distinctly more precise imaging focus and a lovely low-end ‘bloom’ and depth, which seemed to make the recording more real and natural somehow. It was broadly beneficial when applied to ORTF (near-spaced cardioids) recordings, too, again improving the focus and depth. As with the BOF and Stereosonic processes, I didn’t feel that the source recordings were terrible without the processing and brilliant with it, but there were undoubtedly audible benefits, and if the Shuphler was permanently available I’d certainly use it regularly. Overall, then, the various processing modes of this unique stereo signal processing unit are all useful and bring about worthwhile, albeit often quite subtle, improvements to stereo imaging. The key to success, of course, is to apply to right process to the right source material. As unique signal processors go, the Shuphler is surprisingly affordable. It’s a very interesting processor with some intriguing processes, though it won’t be essential for everyone. I see the Shuphler more as a useful polishing tool for mastering applications and/or minimalist (purist) classical music recording enthusiasts who favour working with simple stereo mic techniques. Blumlein’s concept of stereo sound produced by two spaced loudspeakers relies on the notion that both speakers reproduce the same sound at the same time, and that the wave-fronts they produce differ only in amplitude, not phase. This ‘intensity stereo’ concept was detailed in a patent filed in December 1931 and granted to Blumlein in June, 1933. 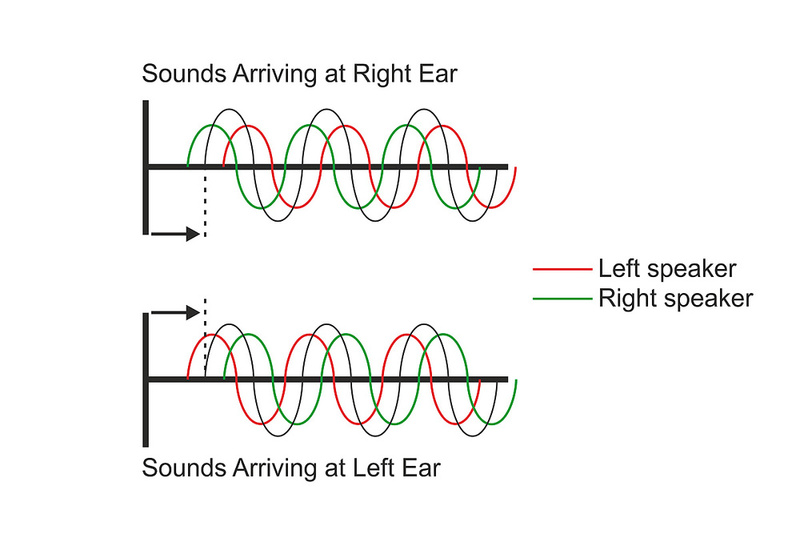 A fundamental part of this system is that both of the listener’s ears hear the outputs of both speakers and — critically — the differing path lengths between a speaker and each ear introduces small time delays (see diagram). Sound from each speaker in a stereo setup arrives at one speaker slightly later than it does at the other.Consequently, each ear receives two sound waves that differ in amplitude (because of the intensity-encoded stereo imaging information), but also in phase because of the relative time delay from the far speaker. 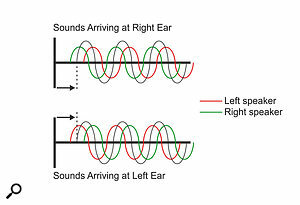 These two sound waves combine at the ear, where the net effect of their differing amplitudes is to alter the perceived arrival time of the composite wave-front at one ear relative to the other thus broadly replicating the way our hearing mechanism detects the spatial positions of sound sources in real life. In many ways it’s remarkable that this scheme works as well as it does, but in reality most of us find this illusion of spatial sound positioning quite convincing and reliable. However, there is a fundamental problem associated with this system, and it was described in a 1958 paper presented to the Audio Engineering Society (AES) by three EMI engineers, Clark, Dutton, and Vanderlyn (all former colleagues of Blumlein’s, continuing his work after the war). 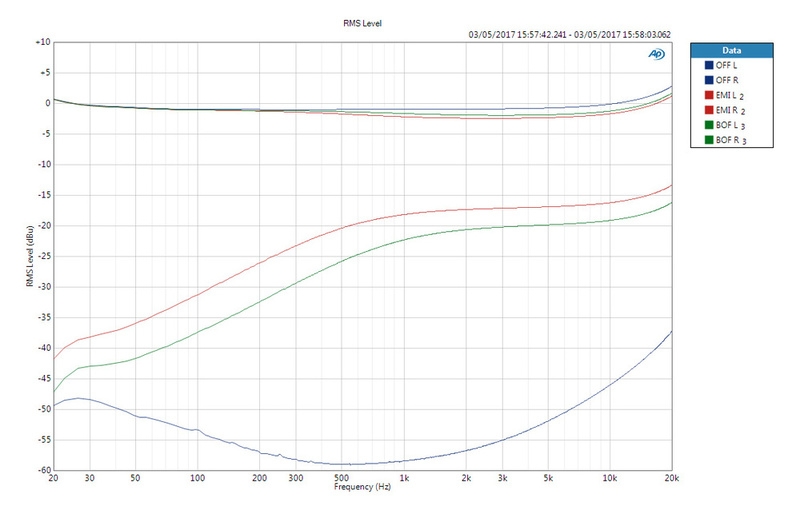 Their argument was that this two-speaker arrangement only works accurately for frequencies below about 700Hz. Above that frequency the listener’s head starts to act as a baffle between the ears, attenuating the signal from the distant speaker to the far ear. This results in the amplitude differences between channels becoming exaggerated at higher frequencies, and so a form of frequency-dependent spatial smearing exists. Putting this effect into visual terms, it’s a bit like the chromatic aberration associated with low-quality camera lenses, where red light and blue light refract differently through the lens, so that crisp edges acquire a red tinge on one side and a blue tinge on the other. In effect, the red part of the image is offset from the blue part, reducing the sharpness of the overall picture. A similar effect happens with stereo loudspeaker setups, and the high-frequency elements are reproduced with a slightly wider image than the low-frequency elements, reducing the overall precision and focus of the stereo image. EMI’s experiments confirmed that the perceived spatial positions of frequency components above and below 700Hz were significantly different, and a corrective filter was designed that transcoded the stereo signal into the Mid-Sides format, reduced the Sides level above 700Hz by 3dB, and then transcoded back to left-right. This filter was called the Stereosonic Shuffler and it was built into EMI’s in-house REDD mixing consoles employed throughout the ’50s and ’60s. Inevitably, the required circuitry was relatively complex and expensive, and unfortunately it introduced undesirable distortions and colorations because of inaccuracies in the necessary phase-correction elements. As a result, many at EMI thought the improvement in imaging precision was outweighed by the tonal compromises, and Stereosonic Shuffling fell out of favour: uncorrected stereo was deemed ‘good enough’ for the end consumer. Interestingly, though, it probably was! In the days when the primary consumer medium was vinyl records, the inherent mechanical and electrical crosstalk introduced by the pick-up cartridges at high-frequencies acted to reduce the HF image width — in effect, imposing Stereosonic Shuffling automatically. Perhaps the resulting sharper imaging is one reason why many still claim the superiority of vinyl! Since this HF crosstalk has been meticulously engineered out of the CD and other digital formats — as well as analogue studio master tape recordings — some form of image width correction remains desirable for these replay formats. 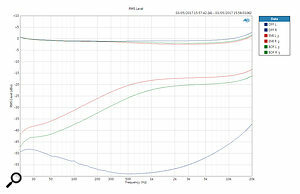 If the output transformers in the Shuphler are not adequately terminated by the destination equipment they exhibit a pronounced resonant peak, which is shown in the red trace, centred at about 35kHz and rising to around +12dB. 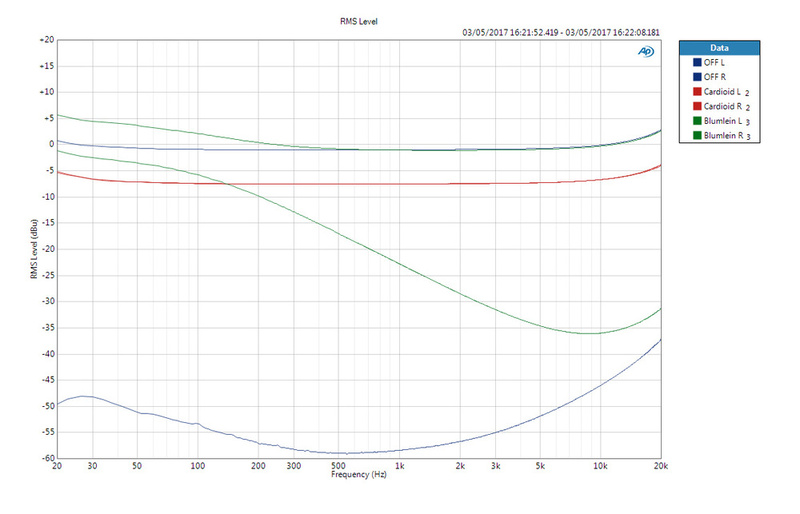 This was due to the abnormally high (200kΩ) default input impedance of my Audio Precision test set. The blue trace was obtained with a 600Ω termination that over-damps the transformers, resulting in a loss of HF. However, a more conventional input impedance of, say, 10kΩ will allow a flat response beyond 20kHz.In running my usual set of bench tests with an Audio Precision test set, the first thing I noticed was a pronounced resonance peak centred at about 35kHz and rising to around 10dB. This was due to the very high (200kΩ) default input impedance of the test set, which failed to load the output transformers adequately. When feeding a more conventional input impedance of, say, 10kΩs, the HF response becomes essentially flat far beyond 20kHz. So ignore the rising response above 20kHz in the following measurement charts; it won’t be there under more normal working conditions. The processional unit can accommodate signal levels in excess of +26dBu, although with the THD figure edging above 0.5 percent. At a reference level of +4dBu the THD figure is 0.04 percent, and the noise level is better than -76dBu (the right channel managed a signal-noise ratio of 87dB, while the left channel was 76dB). This chart illustrates the inter-channel crosstalk for the EMI and BOF stereo shuffler modes. The blue lines represent the Off condition, showing the level in the direct channel at the top and its associated crosstalk into the adjacent channel at the bottom curve. The EMI Stereosonic shuffler (red lines) reveals a very slight reduction of HF level in the direct channel, but a considerable amount of HF crosstalk above 700Hz into the adjacent channel, narrowing the stereo width at HF. The BOF option (green) follows the same overall direct and crosstalk responses, but at a reduced level to deliver slightly less HF image narrowing.As the Shuphler’s signal processing is mostly based around introducing crosstalk between the channels to alter the stereo width in a frequency-dependent way, the following test plots were obtained by measuring the frequency response of both outputs, but with a signal only applied to input I. The two blue traces were derived in the Off mode. In a perfect world there should be no crosstalk to the undriven channel and so only the top trace should be visible. However, the unit actually exhibits relatively high crosstalk levels, even in this bypass mode, although it is below -40dBu across most of the bandwidth (relative to a 0dBu test signal). This chart shows the inter-channel crosstalk for the two microphone-correcting modes, which increase the stereo width at low frequencies below 700Hz. 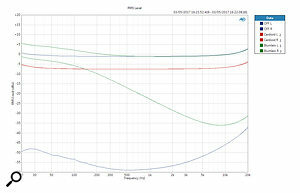 In the case of the Blumlein Shuffler (green), the level of bass in the direct channel boosted, as well as a considerable amount of antiphase LF crosstalk. 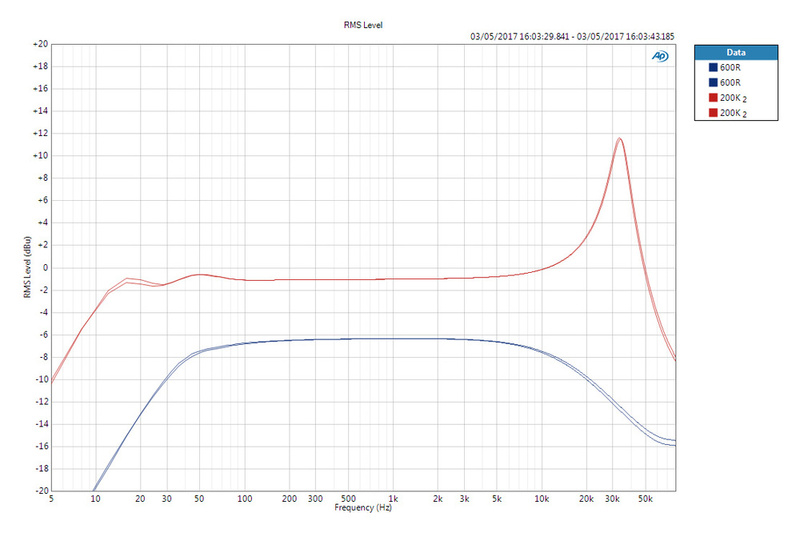 The Blumlein Shuffler is the strongest effect, with the cardioid mode (red) following a similar response but with the levels about 6dB lower.EMI’s Stereosonic Shuffler mode is shown by the red traces, revealing significant HF crosstalk at around -18dB above 700Hz. This acts to reduce the stereo image width, since the same signal in both channels would give mono! The green traces are from the BOF mode, showing a slightly lower level of HF crosstalk, but with the same overall spectral shape. This confirms that the BOF mode doesn’t reduce the HF stereo image width quite as much as the Stereosonic Shuffler, but is otherwise very similar in its performance. It’s also worth noting the complementary reduction in level of the driven channel above 700Hz, too, which is small but, I suspect, quite deliberate. Moving on to the microphone-correcting modes, these are both designed to increase the stereo width at low frequencies below 700Hz, and so the driven channel exhibits obvious bass boosts, while the crosstalk is also enormous at low frequencies. The Blumlein Shuffler is the strongest effect, with the cardioid mode following a similar response but with the levels about 6dB lower. Of course, what these simple plots don’t show is the relative phase shifts between the channels, a polarity inversion being required in the crosstalk signal to increase the stereo width. Allows you to hear ‘true stereo’ for the first time! Improved stereo imaging for near-spaced stereo mic arrays. Surprisingly affordable for a unique product. Perhaps we’ve become accustomed to the deficiencies this seeks to correct? This clever and intriguing product delivers Blumlein’s and EMI’s solutions to the fundamental problems with conventional stereo audio systems. Educational version £479; Professional version (review model) £569. Prices include VAT. Educational version £399.16 (about $520); Pro version £474.17 ($620).